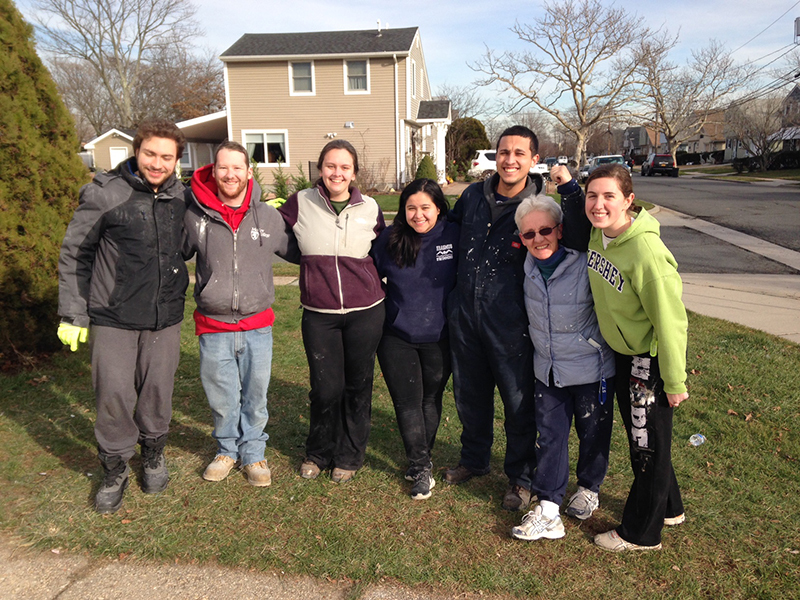 During the week of January 3rd-7th, six young adults, who are members of the Dominican Young Adults Chapter at Molloy College, came together to participate in a service project in Freeport. This year’s build was a collaboration with the Methodist Disaster Relief Services and ourselves. The week began with arrival on Sunday evening, settling into bedrooms, a short tour of the house, dinner, and an overview of the plan for the week. This was followed by an opening prayer service. Unlike the previous year, due to the close proximity of Freeport, we didn’t have to leave St. Hugh until 8:15 each morning so for the most part the young people had enough time to prepare their breakfast, make their lunch (which they needed to bring to the site each day), and be ready to leave by 8:15 am. Quite a challenge for young people who were on break…but they were real troopers and were ready to go. Usually because of the number of participants we would have to break up into two groups, but not so this time. We all had the opportunity to work and experience everything together. At the site the students had the opportunity to engage in all types of work. 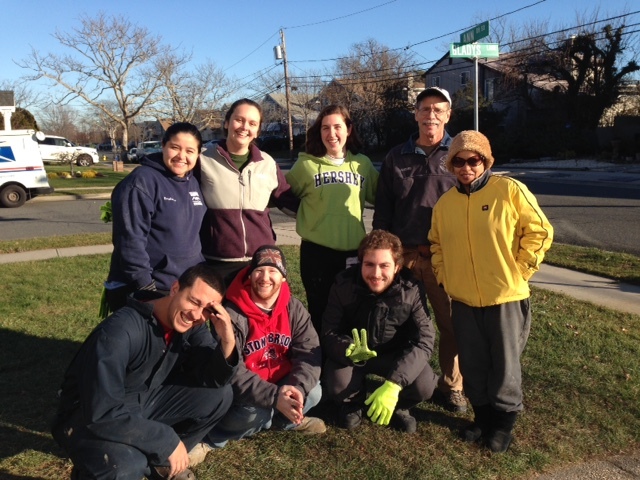 Our task was to rebuild the interior of a garage badly damaged by Sandy. Our initial task was to take off the old sheet rock that was on the walls and replace it with new pieces. With the help of an experienced carpenter who worked along side us, the new sheetrock (on all of the walls and the ceiling) was up in two days. 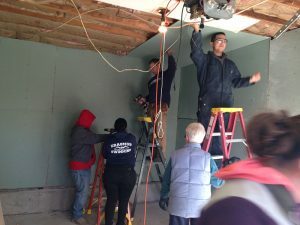 There was a lot of measuring, cutting, hammering, and nail driving that had to be done in a very confined area, but we felt very good when the tasks were done. 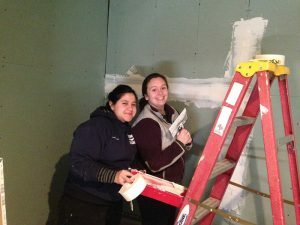 The students had a variety of odd jobs which included cleaning, mudding, taping and sanding the walls and ceiling. There was much to do, but we were determined to do what was necessary to speed up the resettling of this family that once lived comfortably in this home. The young people working along side those of us who are a bit older hit it off right away and the work, though exhausting at times, was done in a wonderful spirit of laughter and fun. We also had the opportunity of meeting the owner of the home we were working on. With tears in her eyes she spoke of her gratitude to these young volunteers. Before we left the site, we promised that we would pray for her and ask God to help make her dream of finally “coming home” a reality. To make the service project more meaningful and to have opportunity to reflect on our daily experiences, our Dominican House of Hospitality housed all of the volunteers for the entire week. Each night after dinner the young people gathered to pray and speak about their day. What or who touched them, and where might they have encountered God in their experience. As you might guess, the prayer and reflection were powerful each night. This experience was a true expression of what we mean by “Dominican Family.” Different parts of the family (vowed religious, associates, Dominican Volunteers and Dominican Young Adults) all worked together to make this week a positive experience for all. No one of us did it all, but all of us did our part. Soon it was time to say goodbye. Our week of volunteering was over and we prepared to leave the site. It was a good feeling knowing that we left the house in much better shape than it was in when we arrived. It was also a good feeling knowing that all of us (the entire group mentioned above) in our own small way assisted in “Continuing the Preaching” in our own lives and the lives of those we met in Freeport.